The Eyes Have It: Are Audiences Seeing Politics as the New Entertainment? 2016 has not been a year short of talking points: high-profile celebrity deaths; an AR critter capturing app gaining more users than Twitter; an entire universe being crammed into one of the most anticipated video games of the console generation; and a mom in Chewbacca mask becoming an overnight star on Facebook Live. But it is politics that has proved to be an ever growing black hole of attention and conversation, and it’s sucking up audience share at an incredible rate. 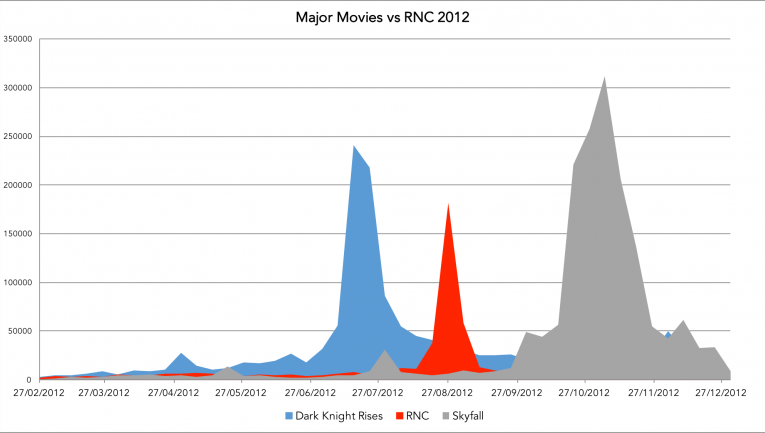 In the past, politics has taken a relatively small slice of the audience share in comparison to major events in entertainment such as blockbuster behemoths like superhero or James Bond films as the graph below demonstrates in comparison to the Republican National Convention of 2012. 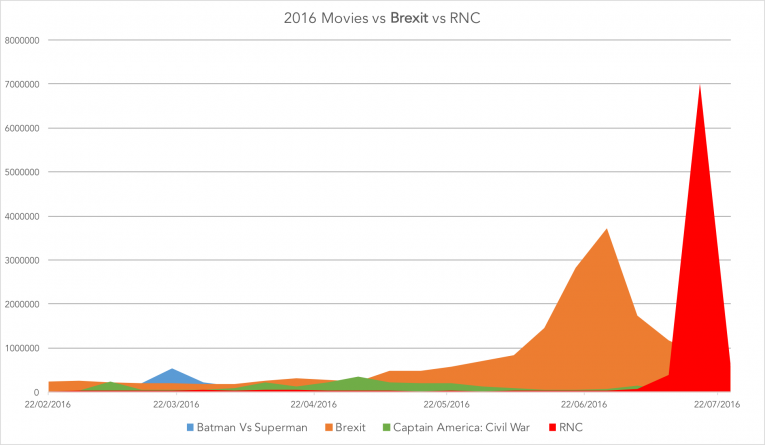 The conversation surrounding political events like Brexit and this year’s RNC has dwarfed that around two of this year’s biggest box office successes. Politics is receiving a vast amount of attention share and therefore reducing visibility for everything else. Are audiences perceiving politics as being even more entertaining than entertainment itself? Back in July last year, the Huffington Post stated that they would be covering Donald Trump’s campaign to become the GOP’s Presidential candidate as entertainment only, and how prophetic a decision it has turned out to be. As a former reality TV star, Trump has an innate ability to create drama on a daily basis and the media and public have reacted to him at every turn. His lack of willing to play by normal political rules has seen him reach audiences previously uninterested in politics and has kept them engaged by talking to them directly. In a time where the internet is becoming increasingly tailored to the needs of the individual, Trump spoke to an audience other candidates were afraid to and built his base appeal via segmentation. In doing so, he has created a vast amount of controversy and outrage, which has only generated more conversation around him. Trump has simultaneously become equal parts hero and villain, making him a compelling figure regardless of the audience’s view of him. He has also been persistently put into the role of the underdog by the mainstream media - only furthering his anti-establishment narrative- and across the Atlantic, a similar story reached boiling point. On June 24th, Britain awoke to the news the electorate had voted to leave the European Union after months of bitter campaigning by both sides of the argument. The unexpected result propelled the story to headlines across the world and while, like Trump, the Leave campaign had reached out to previously disenfranchised voters, it is perhaps the pace of events that led to Brexit dominating conversation. In the immediate wake of the decision David Cameron tended his resignation; the pound fell heavily against the dollar; a vote of no confidence was levied against the leader of the opposition, Jeremy Corbyn; and reported hate crimes against minorities rose by 42%. The UK continued to revel in its own Game of Thrones as potential candidates for Prime Minister seemed to fall no sooner than they’d begun, most notably Boris Johnson, whose leadership of the Leave campaign had been seen by the media as a vanguard for his desire to be the next Prime Minister. It’s little wonder then that such an eventful, unpredictable, and divisive story came to dominate the attention of millions on social media. It is this narrative of the unexpected and uncertainty that has led to audiences engaging with politics on an unprecedented level that even exceeds the attention share normally enjoyed by entertainment, and it is this dominating visibility that can cause issues for brands trying to establish their fair share. The vast audience attention share that’s commanded by popular entertainment or user generated content is normally healthy for brands competing for attention. Businesses are often able to appropriate popular culture events into social media campaigns to keep their brands on trend and competitive in the online social space (e.g. see how the success of Pokémon Go has inspired marketing within the tourist industry), but political appropriation is often treacherous for a brand’s image. Another characteristic of the major political stories this year is that they ultimately come down to a binary decision separated by an ideological divide. With the polls remaining marginal in the presidential contest between Clinton and Trump and the mere 4% majority of the Brexit victory, any attempt to appropriate politics into branding will almost inevitably draw inferences of endorsement within your audience and potentially split it. The gains from such an approach are negligible and the risks are high and as a result is ill-advised. The long-term impact of politics acting as entertainment is difficult to call. While Trump remains controversial, his antics are becoming increasingly familiar which often dulls controversy over time. However, whoever wins the presidential race will be put under a level of unprecedented scrutiny after what will be one of the most polarising contests in American history. The narrative for Brexit continues as the British government is yet to enact Article 50 to withdraw from the EU and uncertainty continues to dog the economy and policy alike, but following a peak in conversation directly after the event the pace of has slowed and as so has the conversation frequency. This year could be an anomaly or just the beginning of a new political landscape with a re-enfranchised electorate keeping the subject’s visibility at a dauntingly high level. With attention being a finite and precious resource online, it may be time for brands to learn how to identify, target and maximise their share of it.